DJ Drew Diggle is a DJ in Raleigh, North Carolina. He was a resident DJ at Neu Romance throughout its existence (2003-2013), and at many other public and private parties and special events after that, including Halloween and New Year&apos;s Eve parties for the past several years. View a small selection of flyers from previous DJ Drew Diggle events. Drew Diggle has been working with digital music and music production since 1985, and has been DJing since 1998. Drew learned how to DJ on a friend&apos;s Technics turntables, and later applied those skills to CD-J and digital DJing. 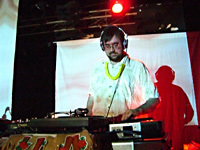 DJ Drew Diggle was given his name by DJ Madcow, Chico Scott of Neu Romance. DJ Drew Diggle (Drew Davidson) is occasionally known as DJ Drew Davidson, or just DJ Drew for casual/local events in Raleigh. Drew spins many different kinds of music, depending on the event and the crowd. In addition to the above, DJ Drew Diggle has DJed at many of the opening parties of the Mosaic Spring Music Fest and Mosaic Fall Music Fest, as well as at dozens of after-parties and special events for the Carolina Roller Girls starting with their inception. 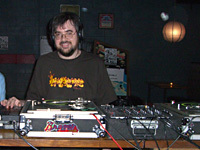 In addition to regularly DJing at the original Kings Barcade location on McDowell Street and Alibi Bar, DJ Drew Diggle has had guest DJ spots at dozens of Raleigh area bars, restaurants, and art galleries for over 16 years, including at several historic Jazz Anew and Bickett Gallery events. Given advance notice, DJ Drew Diggle can provide a customized music selection for virtually any type of event. DJ Drew Diggle is a full mobile DJ and can provide an appropriate sound system as well. Please Contact DJ Drew Diggle for more information.